The question is, how and why did the tiny fishing port of Murano become home to history’s best glassmaking? Through a combination of artistry, innovation, hard work, and a steady demand from Europe’s elite for the finest things. From as early as the 8th century, Venetian glass was world-renowned. The local style combined Roman techniques and technologies with methods from the Byzantine Empire and Asia. In addition, Venice’s community of artists refined their craft alongside other master glassmakers, incorporating all of their innovations into truly stunning pieces. In 1291, the Venetian Republic ordered all its glassmakers to move to Murano to protect Venice’s vulnerable wooden structures from the superheated fires required to make glass. The glassmakers made the move, and soon become leading citizens of the island. They were granted the right to wear swords, enjoyed immunity from prosecution by the Venetian state, and eventually married into Venice’s most elite families. But, this privilege came at a high price – glassmakers weren’t allowed to leave. If a glassmaker decided to relocate without permission, he risked assassination, having his hands cut off, or violence to his family. Why was so much attention focused on these glassmakers? Why were such rigorous restrictions in place to keep them from moving? Because they were the best. Murano glassmakers were the only ones in Europe who knew how to make clear glass mirrors. They were also the only ones who could work with certain glass, such as crystalline, enameled glass, threaded gold glass, multicolored glass, and milk glass. For centuries, the Murano craftsmen had a monopoly on quality glass, and the Venetians guarded their golden geese carefully—keeping their glassmakers captive as well-tended, generously compensated prisoners. Modern glassmakers are free to leave the island, but Murano has certainly maintained much of its tremendous charm over the centuries. It still feels today like a miniature Venice, with small canals, bridges, palaces and churches. Made up of five islands, it has around 7,000 residents, with rows of glass shops lined up one after another on the scenic waterfront. 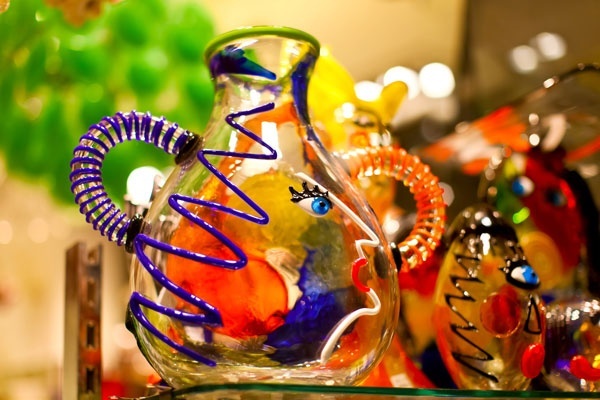 Visitors can find a wide range of original Murano glass objects; from kitschy glass animals figures to elegant wine glasses from world renowned studios. It is fascinating to look over the shoulder of a glassmaker and watch their artistry in action. The glass is all handmade, depending entirely on the skill and technique of the artisan who shapes molten glass into stunningly delicate pieces. It is a complex process, requiring the glass to be infused with specific chemicals that allow it to soften at lower temperatures so the master glassmakers have time to mold it into shape. Colors and different materials are added depending on the look a glassmaker is trying to develop. Vibrant hues and patterns are created by adding different materials, with designs revealed when the glass is cut into cross-sections. There is an incredible number of variations and possibilities for glass objects –only limited by the artists’ imaginations. Watching these creations transform from glowing lumps of molten glass into the astonishingly beautiful finished product is a delightful process to observe, and well worth a visit to famous Murano. Join us on a Mediterranean cruise, or one of our other Italy tours to see this beautiful region in person on your next European vacation. Bella Italia and other European tours including Venice, Croatia & Cuba Cruise and Tour take you to Venice, Italy. To make your plans to join a fully-escorted Italian vacation, call your travel consultant or YMT Vacations at 1-888-756-9072.